Unique ”Solutions” for A Unique Smithsonian Museum! Months ago, we told you we were awarded a truly unique AESS (1) job in Washington, DC. Since then we have given you glimpses of what was planned. Well, now we have reached the “reality” stage and have begun all-out production! Let me tell you more as this job will provide a real “window” into our capacities, advances and actual systems to deliver! Over the years we have talked briefly (or not so briefly at times!) in these media about our capacities, advances and systems in place (or planned) to deliver whatever you need in metals fabrication! Now we have been challenged by this job (NMAAHC) (2), but we are meeting the logistical, engineering and even paperwork specs of this signature project every day as we adjust to meet each essential change as they come. (3) Metfab Metals has been making small and large AESS parts for more than two (2) decades now, but this art form is now expanding into ever more uses and applications. NMAAHC might best be described as the “highest and best” use of this art-----as it runs throughout the entire structure, and forms the outside superstructure of the façade on all four (4) sides. This will truly be steel made to look like extruded plastic, molded to a purpose plastic could never fulfill. These facades are our work now----and we are well into production now, ahead of schedule too! But what does this mean to you, customers of Metfab Metals? It means we have adjusted, learned and understood our marketplace and our industry. So much so that we can fulfill all your metals needs.We have learned and implemented better “transparency”, better parts, better buildings and better records of how we did it all. We here at Metfab Metals can’t produce every available part and aspect of a project, but we can be an open, participating part of your project----and will be. What all of this will amply demonstrate is that communication, transparency, cooperation and coordination in these fabrications cannot be over-done or over-stressed and the end results are our specialty parts arriving at your jobsite in installation condition, as designed. Metfab Metals has decades of experience making these parts and making YOUR jobs go smoothly and end successfully! Call us; you’ll soon see what we have written here is what happens there. 1. AESS, or Architecturally Exposed Structural Steel, is what we have now defined many (to some of you regular readers TOO MANY) times as finely -finished steel members (prepped, welded, filled, blasted, polished, and/or uniquely painted/finished) to be permanently open to the view and touch of all after the job is done. AESS work is never covered by sheetrock or otherwise hidden from public view. 2. This is our daily shorthand for the rising National Museum of African American History & Culture which now occupies the last lot on the mall facing the Washington Monument. 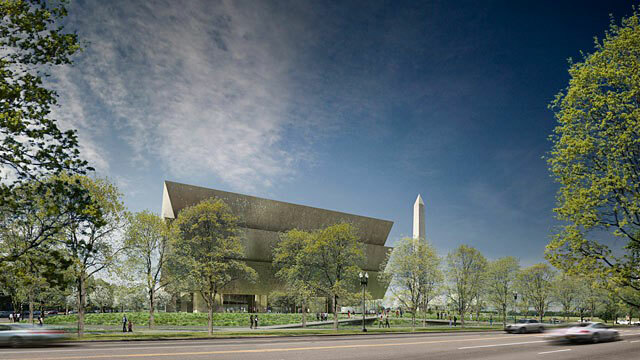 See www.nmaahc.org for a really impressive video and overview of this truly 21st century edifice! 3. We joked (only half-kiddingly) that, at the end of this job, the weight of the paper we have generated would exceed the steel we delivered----even though the actual fact is that the total steel will exceed TWO (2) MILLION pounds! 4. As said by noted author, C.S. Lewis. The photos below are of existing and proposed uses of abandoned “real estate right in the middle of Manhattan, New York City. These are before and after (as proposed) pictures of a creative project idea for great space that is almost totally unused right now. Closer examination of this concept shows how fabricated steel can again play a crucial role, as it did in 1900-1920 when this old “trolley” station was first improvised. 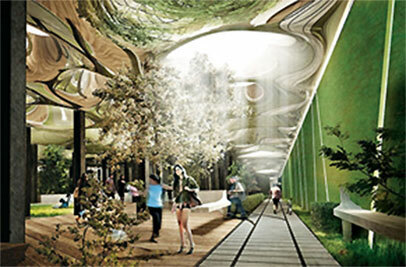 While it’s underground, it has mass transit access and can be designed (look at the suggested design from one architect here) and fashioned into a number of uses, largely like an underground mall. Existing Essex St. Trolley Station, NYC. by Ramsey & Barasch, Architects-- 11/2013. After streetcar service ended in 1948, The trolley terminal itself was just left vacant. (Can you imagine acres of vacant land in New York City being left undeveloped over 60 years!!!!!),…….. It is still there with the dust of over fifty years almost covering over the tracks. Construction work on the nearby Centre St subway station started in 2001 and may lead to the development proposed in the architect’s rendering. But to do any of this, steel is indispensable; uniquely fabricated steel even more so. 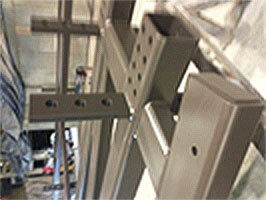 In turn to fabricate steel now in the 21st century, we still the right tools. But you may be surprised what tools are “right” today. When shop guys in the 19th & 20th centuries spoke of “tools”, they meant wrenches, hammers, pliers, punch presses, shears and the like. We still need those, of course. But now 14 years into the 21st century here at Metfab Metals, and doing the sophisticated AESS work we regularly do, much more is looked upon as our everyday “tools”. As we involve ALL of our staff in “building” our parts and expect even our shop personnel to understand our non-shop tools (e.g., our CAD program, an array of laptops and servers just to quote a job, iPad-stored QC/QA reports, computer-designed Production Plans, our CNC-driven machinery, our Plasma Cutter (also driven by computers/computer images direct from the customer), multi-function shop equipment and so much more. Of course also, the right tools without the right people is a recipe for disaster.. We have always striven to hire only good people in the first place to lend their “brains” to our efforts, but now their knowledge, experience and ability to learn is even more critical. We require people with lots of energy, a passion to do things “right” and (above all) integrity! Integrity assumes basic honesty, but it also includes full disclosure. While that may seem an odd requisite in a steel shop, it really isn’t. 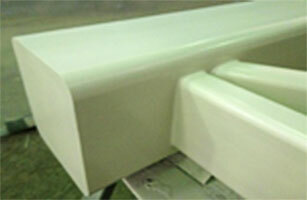 Look at it this way-----we work now with micro-tolerances once uncommon in fabrication. If we cannot rely on ALL our staff to report the slightest deviation, we can be a long way into a job (maybe even after delivery to a jobsite) with non-conforming parts that will hold up construction. We can’t---and don’t---tolerate this. We stress repeatedly to ALL our employees that they must make their supervisor aware of even the slightest discrepancy in the production process and/or variance from the fab drawings. Only in this way can we make the parts ordered, as designed and spec’d. Our owner, Jim Murray, trumps even this attention to detail with his constant presence in the shops, as well as his constant contact with all supervisors six (6) days a week! Few details ever get by this screen!!! Let me tell you more as this “attention to detail” provides for you a real barometer of Metfab Metals’ capacities, processes, advances and actual timely, accurate delivery of all your jobs, large and small alike! If you haven’t tried us recently, give us a shot as you we will NOT disappoint you or fail to deliver as promised. If it’s AESS parts you need Metfab Metals has been making small and large AESS parts for more than two (2) decades now, as this design feature is now becoming commonplace in ever more uses and applications. But what does this mean to you, the customers of Metfab Metals? Well, it means we have adjusted, learned and understood our marketplace, our industry and----most of all---you, our customers. So much so that we readily fulfill all your advanced fabricated metals needs. In this way, Metfab Metals daily shows you that we are “team players” who want to be part of your regular building team, even at the design stage, of YOUR jobs so that together we can early on spot potential fabrication and/or erection issues and thus deliver truly fine products to become integral parts of truly memorable and lasting buildings, without costly and delay-inducing change orders. Try us! DPAC ( Dr. Philips Performing Arts Center ), Orlando, FL ----This long-delayed job is back online and on time in part due to our efforts as the new metal fabricator of the custom anchors that were needed ASAP for this emergency. We are almost through production and will be 100% done and delivered before the end of this month---well ahead of the new schedule. 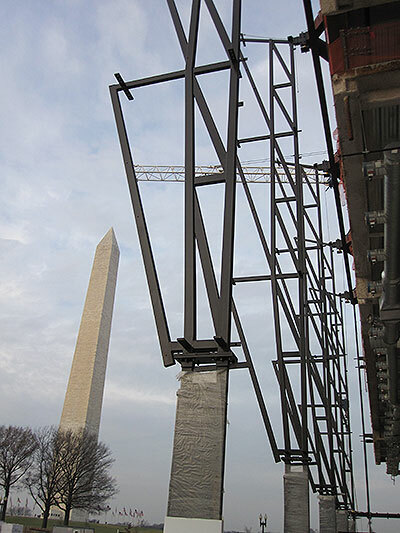 National Museum of African American History & Culture, Wash., DC (NMAAHC) --------We are already producing twenty-four (24) strict-tolerance AESS vertical trusses as well as exterior frame parts under the strictest Project Management principles. To us, this is a laboratory for QC/QA ins the strictest sense. Documentation has prompted our development of permanent matrices that will be our paradigms for all future jobs. 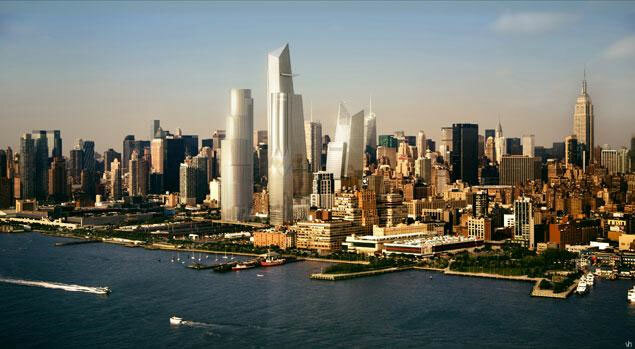 Figure 1-Rendering of Hudson Yards, in Manhattan (NYC) - the LARGEST private development in history! Metfab Metals is, and has been, committed to “total quality”: from responding to an RFQ, in QC/QA stages and documentation; in contract execution; in production protocols; in project management; and in making our customers always proud of our work on their jobs. Hudson Yards, above, was our next target as a “signature job” where we hoped to do AESS work even more challenging than all the AESS we have done in the last twenty (20) years since the BWI airport job (1) , even including our current work at NMAAHC. (2) With Time-Warner’s recent (January) commitment here and long-term work by the Related Companies, BOTH towers are now a reality. We earlier made (even without a PO & at our cost) samples to show our commitment to produce the mullions (and more) needed for these new skyscrapers and associated structures. And recently, we were rewarded with this job for the AESS (3) mullion work for the lower floors of the first tower. [We’ll tell you more here in this space, as this world-class project develops over the coming months.] 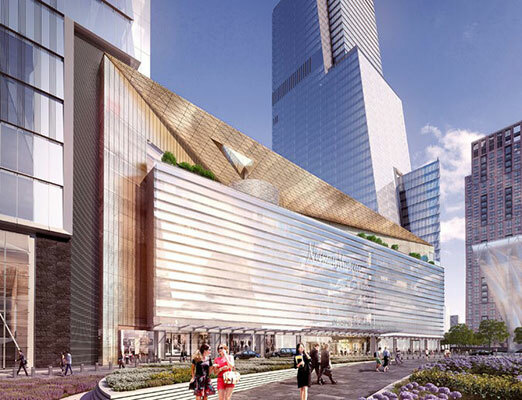 As there is also a fair amount of AESS in the planned “Culture Shed” (see rendering below) at this Hudson Yards Project, we will later be seeking an RFQ for this beauty too! This is just the type of creative use of AESS concepts in steel that ever more architects are designing into aesthetic “creations”-----both utilitarian and beautiful! We here at Metfab Metals will not be left behind. We have been putting our proverbial “money where our mouth is”. We were already updating our programming, equipment, staff, procedures, QC/QA manuals----and much more----to accommodate the needs and specs of these mega-projects and learning how we can integrate our information, programs and procedures into the job-tracking requirements of such large-scale projects. Now, this is not altruistic on our part; it’s BUSINESS, pure & simple, in 21st century style. We can now actually “tell” you, and “explain” to you, even “demonstrate” to you what we have already done----as well as what’s coming----that will help all of us deliver a better job, faster and on time, and at cost savings. And simultaneously comply with all the demanding specs of such jobs---not just as to the steel itself, but as to job sequencing, QA/QC reporting, credentialing, electronic record keeping, transparency, information exchanges, and so forth. We here at Metfab Metals will never produce every part of a project and cannot be involved in every aspect of a project, but we are very often an early, essential, participating part of your projects----and want to be. 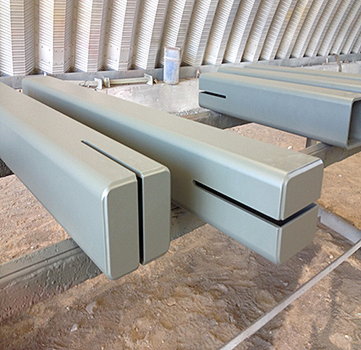 With the integration of our technology,Metfab Metals can now demonstrate that communication, transparency, cooperation, equipment-updating and electronic coordination in these fabrications----from the very start----cannot be over-done or over-stressed and that the end results are our specialty parts arriving at your jobsite in installation condition, and as designed. Metfab Metals, LLC has decades of experience meeting your specs, making adjustments, then making these parts right and making YOUR jobs go smoothly, on time, and end successfully! National Museaum Of Affrican History & Culture ("NMAAHC"), Washington, D.C. ---- Our fabrication work for the “Performance Mock-Up” (“PMU”) is done and looks A-OK. Now the design team of this unique structure is testing it from a performance vantage point. This is going to be a water-shed job of our AESS (1) skills. The job fabrication aspect of our contract should commence shortly here. Look in this space for further updates as this landmark work progresses. Hudson Yards, New York City, NY -----As outlined above, we were just awarded (February, 2014) the fabrication/finishing of AESS mullions for the lower floors of the first tower to be built in this mega-project. This is going to be a water-shed job demonstrating our AESS (4) skills----a result we have prepared for now for over 20 years. Look in this space for further updates, as this landmark work progresses. NMAAHC. 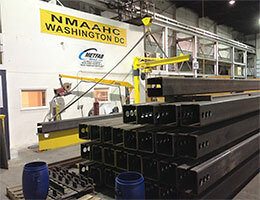 Washington, DC-----More AESS (5) tube steel and mullions are being fabricated and finished daily for delivery this summer. We are now into the production phase of this demanding paint spec----3-part high-performance metallic paint. Look at the finishes pictured here in further updates, as this historic job becomes a reality! 625 57th Street.NYC, NY (Manhattan) -----Here again, we are already delivering to our customer with early stage embeds, with other work to follow (we hope)! Children’s Hospital of Philadelphia (“CHoP”).Philadelphia, PA- ----- We are now in the final phases of this job. We have delivered thirteen (13) levels (floors) of under-level steel----a somewhat unique application. We always offer to work with our customers from the job concept stage to anticipate issues before fabrication, to suggest better ways to order, extrude, cut, drill, paint, finish, even stage and deliver-----and always to save time and money. 1. 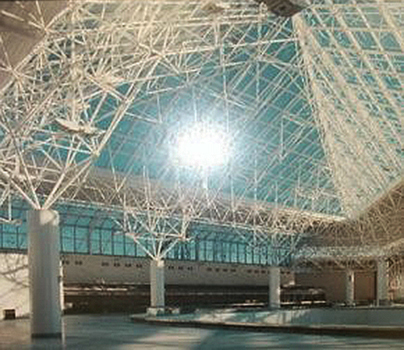 Now the Thurgood Marshall BWI Airport where we did our first significant AESS job making the suspended ceiling web that still looks fresh now almost twenty (20!) years later. 2. National Museum of African American History & Culture, Washington, DC----now under construction and to be dedicated in 2015. 3. For those still unfamiliar with this acronym, AESSis Architecturally Exposed Structural Steel, and is finely-finished steel members (prepped, welded, filled, blasted, polished, and/or uniquely painted/finished) to be permanently open to the view and touch of all after the job is done. AESS work is never covered by sheetrock or otherwise hidden from public view. 4. This evolving art form and architectural esthetics (at which Metfab Metals has acquired a real scope of expertise) will be similar to the support columns that now grace the podium levels of WTC4 at Ground Zero in NYC. We are so proud to have done those AESS WTC4 components. This Newest Smithsonian Museum Moves Closer to Completion! In recent months, we have worked on this classically unique AESS (1) job in Washington, DC. Over the last two years we have posted pictures and reports of what was designed, planned and then to be executed for this mega-project. Just this past January, we reported the “reality” stage of our beginning actual all-out production. Now look where we are! The plus-part is that even we here at Metfab Metals are now realizing an extra dividend from the months of preparation for NMAAHC. We now have in place additional personnel and even better monitoring to further guarantee the higher quality demanded in the bigger jobs now coming online. What does this mean to you, our customers? It means we can do your jobs not only quicker, but produce an even better result, conformed to a higher spec. We can now work better with your project managers, respond more quickly to your RFQ’s, comply better with evolving documentation needs (LEED, “Conflict Materials”, SBA certifications, welding certificates, mill certs, QA/QC daily reports, electronic exchanges, and so much more), mobilize faster for your jobs, fabricate to any new standards, deliver on time, and ultimately supply you only with spec-compliant parts. In this way, Metfab Metals can again show that we are “team players” who want to be part of your regular building team, even the design team, of YOUR jobs, so that together we can deliver truly fine products as integral parts of truly memorable and lasting buildings. As we have said before, we here at Metfab Metals can’t produce every available part and aspect of a project, but we can be an open, participating part of your project. 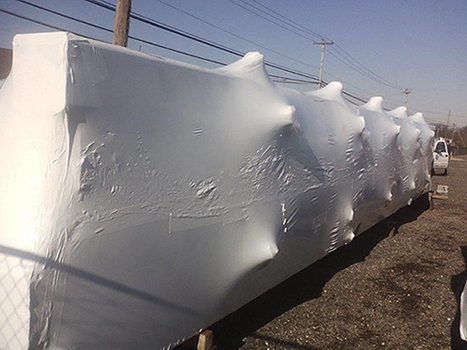 What all of this will amply demonstrate is that communication, transparency, cooperation and coordination in these fabrications cannot be over-done or over-stressed and the end results are our specialty parts arriving at your jobsite in installation condition, as designed. 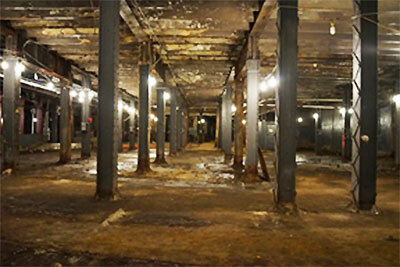 625 57th St., New York City------We are about to start the next phase of this job. 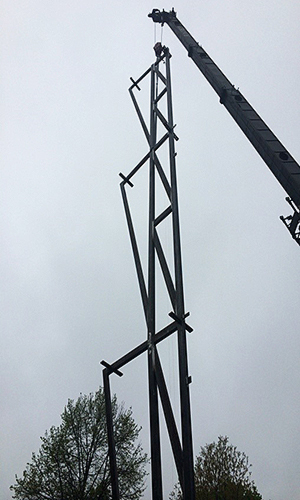 We have already delivered on the first PO released to us and are now gearing up to craft these quadrilateral tubes and channel fabrications, essential to the design of the ultra-modern exterior of this Midtown, West Side tower. Hudson Yards, New York City------Samples of the AESS finishes we will supply after the milling, straightening, cutting and finishing of these columns have been delivered to our customer for final review by the design team. We look to deliver later this year the first set of these highly-finished, bar stock (solid) vertical mullions, with the remainder being delivered in 2015, per our recent contract. This is just part of this huge development of a cluster of Midtown, West Side towers and related structures. 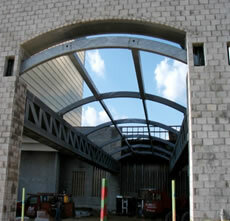 Air Force Base, Miramar, FL ------We sent out the last segment of this job just this month. This job is another one we have completed in Florida and other venues, below our New Jersey/New York metropolitan areas. It too required our expertise for these AESS finished parts and building members. Watch for future online updates after our Newsletters in direct emails to you and your project managers. 1. AESS, or Architecturally Exposed Structural Steel, is defined as finely-finished steel members (prepped, welded, filled, blasted, polished, and/or uniquely painted/finished) to be permanently open to the view and touch of all after the job is done. AESS work is never covered by sheetrock or otherwise hidden from public view. 2. We have added staff just for this job, such as dedicated QC compliance field reps, welding inspectors, even computer personnel so that we could readily supply all progress reports expected of us as to this finished, exterior steel.! Most folks have no idea what a “kluge” is, but some of these odd items really exist---and can be quite useful (not the one in the cartoon, of course). The word (pronounced to rhyme with huge) simply means “a clumsy or inelegant”---but surprisingly effective---make-shift device that solves a problem. (1) Its most significant shortcoming is that as it provides somewhat of a temporary or stop-gap solution, it is “rarely reliable”. (2) [Take a close look around your own shop or warehouse and you’re likely to find one, maybe even just a long power cord running over & around things to power something where there really should be a new outlet or a better electrical supply device. Well, we here at Metfab Metals make no kluges or “Rube Goldbergs” (as these curious devices came to be called); though Metfab is well-known as a good source of short-term---followed immediately with long-term---metal solutions, often in AESS (3) finish. What we make are first-rate steel parts (of all kinds, as you can see on our website at www.MetfabMetals.com) which are not at all “curious”or “inelegant”, but always are both reliable and a real “solution” to your needs. In doing so, we are not averse to supplying interim “patches” you need to avert a construction delay or to avoid a work interruption. But it’s the permanent real-life, real-time solutions you always need---------and we routinely supply. Unique AESS parts, mullions, trusses, even anchors are just some of these “solutions” that we provide every week to our customers. What comes along with these parts is the expertise and experience that regularly solves knotty issues we recognize here BEFORE fabrication (and to avoid consequent jobsite installation delays) that unfortunately the drawings do not always illustrate. 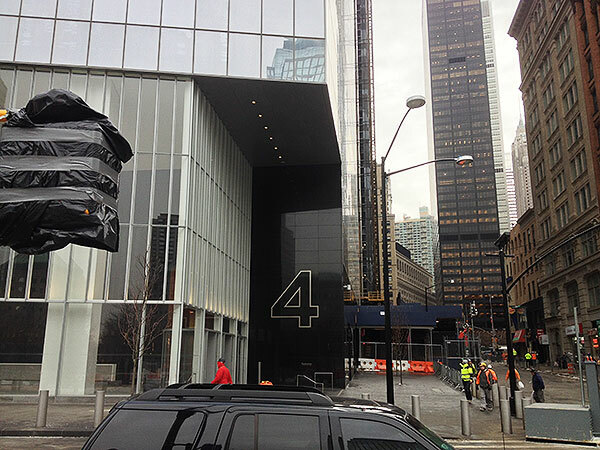 Look at the huge window mullions below that we made a few years back for World Trade Center 4 (WTC4) in New York City. For a number of reasons, not least security, these were made from solid bar stock (some weighing in at thousands of pounds), and then finished to appear as smooth as a fine plastic extrusion might. Only the “feel” of it, as installed, gives it away as steel. Much of our expertise went into making these “right” in our shop so that there were literally NO install problems. But what does this all mean to you, our customers here at Metfab Metals? It means we can---and do---provide “solutions” every day to our marketplace as we are a true 21st century incarnation of steel fabrication. Indeed, we have such a storehouse of experience and expertise that we can fulfill all your most sophisticated metals needs.We have learned and implemented better “solutions”, better methods, better production, even better recordation of all of it (to satisfy even the tightest QC specs). Challenge us with your next job. We’ll prove it to you too. We here at Metfab Metals can’t produce every part and aspect of a project, but we can be an integral, participating part of your project----and will be. 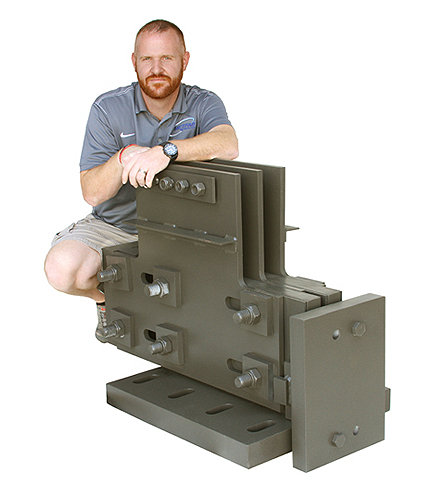 What all of this will amply demonstrate is that the end results are always our specialty parts arriving at your jobsite in installation condition, as designed, when needed and as ordered. 1. Excerpted from KLUGE, Gary Marcus (Houghton Mifflin Co. 2008), page 2. 2. Same reference as in footnote #1, but at page144. The original Rube Goldberg was a world-famous, world-class cartoonist known to all in the generations alive in the 1940’s & 50’s & even later. Today his name is synonymous with funny “solutions” to real problems. The above he drew as a very un-serious “solution” to walking on icy pavements and the safety needs of those pedestrians. The device is patently silly, but it makes the point! 3. AESS , or Architecturally Exposed Structural Steel, is simply defined as finely -finished steel members (prepped, welded, filled, blasted, polished, and/or uniquely painted/finished) to be permanently open to the view and touch of all after the job is done. AESS work is never covered by sheetrock or otherwise hidden from public view. Recently a customer told our COO, Jim Murray that Metfab Metals is now an “AESS Preferred Vendor”. We had little idea what this actually meant, but we certainly liked the sound of it. Upon inquiry, we learned that it is an internal designation that tells all project managers that they can be assured that such vendors have already produced the needed item in compliance with all job specs, and did so in a timely manner and within budget. Needless to say this can save a project manager a lot of time in identifying what sub “out there” can comply with his/her job spec. We learned at the same time that we had already been an “Approved AESS Fabricator” and learned that this designation was also familiar to all their project managers assuring them that such a fabricator had the requisite skills and facilities/expertise to at least make AESS steel. 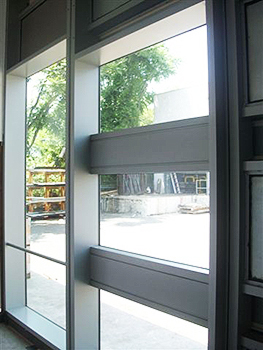 However, it does not carry with it the further assurances that the fabricator will always be a reliable vendor, complying with all job specs, in a timely manner and again within budget. Why might this be important to you (as well as your customer)? Well--we can help you in many respects ----from very simple metal parts to the sophisticated, finished parts that require an approved (experienced) AESS fabricator and even a “preferred” vendor ofAESS Here at Metfab Metals, we have been selling AESS (1) parts, assemblies, mullions, trusses, even anchors for over 20 years. We do this daily for both new and long-established customers, on small and large jobs. AESS production keeps one of our shops and some of our staff busy every day; the rest of our shop personnel are busy making all of our other product line which ranges from the simplest steel anchor to mundane items such as a beam fabricated to support an old façade of a rehab’d condo----not AESS, but a member to be concealed inside the finished structure. Look at the huge vertical truss we just completed (May 8, 2014) for the mega-job NMAAHC (2). For a number of reasons, not least security, these were made from heavy-wall tube steel (some trusses weighing in at thousands of pounds), and then finished to appear as smooth as a fine plastic extrusion might. Only the “feel” of it, as installed, gives it away as steel. Metfab Metals can, and does, provide these AESS “solutions” every day to our customers. We can do it with such experience and expertise that we readily fulfill all your most sophisticated metals needs---and on short notice. As we have said before, we’ve learned and implemented better “solutions”, better ways to expedite, better production methods, better QC and even better recordation of all of it. Call us with your next job. We’ll prove it to you too. 625 57th St., New York City ----- We have made models of the distinctive quadrilateral tubes and channel fabrications, drawn to the design of the ultra-modern exterior of this Midtown, West Side tower. We are working closely with job engineers (often remotely by 3-D drawings to our CAD Program) and can adjust with them fab drawings to comply with parts that have NO 90 degree corners--quite a challenge. Watch our coming Newsletters for updates. Hudson Yards, New York City ------ Samples of the required AESS finishes have been delivered to our customer and the final review by the design team is underway. Fab drawings should be received soon so we can deliver these highly-finished, bar stock (solid) vertical mullions before the end of 2014. These will form the lower exterior “skin” of these futuristic West Side towers. And later similar mullions will clothe related structures on the same site, such as the projected “Culture Shed”. Look at all of these design beauties at their terrific website, www.hudsonyardsnewyork.com. making YOUR jobs go smoothly and end successfully! 1. In case you need a fuller explanation of the term, AESS, or Architecturally Exposed Structural Steel, is simply defined as finely -finished steel members (prepped, welded, filled, blasted, polished, and/or uniquely painted/finished) to be permanently open to the view and touch of all after the job is done. AESS work is never covered by sheetrock or otherwise hidden from public view. 3. Again, you can see this for yourself with a click to: www.nmaahc.org for a really impressive video. This is what a customer told our Jim Murray recently. Now, standing alone, that is not a really surprising remark. EXCEPT, this statement came from a curtainwall supplier, not a tech company. But, when you think about it, the words are more accurate than not. 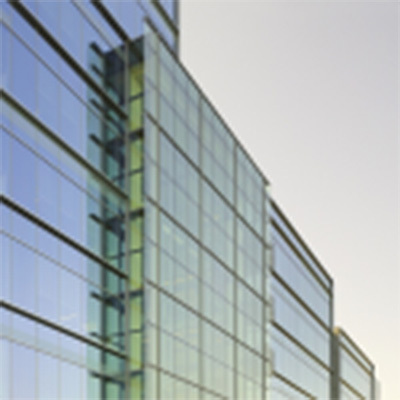 Yes, they sell steel curtainwall units, parts and assemblies------- and the team to erect them. Yes, they buy fabricated metals from us to re-sell in these units. Yes, their website is about steel, not primarily technology. So, what our customer was really telling us is an obvious point. You can’t build anything, or supply anything needed to build, without technology. The corollary that comes with this is obvious too: the better your technology, the better you do all the integral steps from design concept to total contract fulfillment. We just want you to simply know that Metfab Metals has been buying, fabricating, communicating & selling with all the best technology we can get. Our technology literally makes it possible to make the AESS parts illustrated above---and make them how, when & as our customer specs them. Quotation Process---this process often starts with an email, PO or RFQ sent electronically---TECHNOLOGY! Contract Stage---on many jobs now all contracts SOLELY exchanged electronically---TECHNOLOGY! Documentation---routinely now sent back & forth ONLY electronically-- TECHNOLOGY! Project Drawings----CAD---from a rough sketch to initial drawings to final & fab drawings, all sent electronically--- TECHNOLOGY! Project Specs---specs to QC Manuals to daily QC reports (often done only on iPads) sent electronically-- TECHNOLOGY! Change Orders---no longer by faxes; routinely done in email format sent electronically--- TECHNOLOGY! Contract Adjustments----in 3-D drawings---back & forth by CAD electronically, initial drawings to final & fab drawings, constantly updated & zipped to & fro, all sent electronically -- TECHNOLOGY! Job Closeout ---supply compliant LEED certifications, “Made in America” cert, and fulfill other spec compliances & closeout documents, all sent electronically---TECHNOLOGY! So what’s the obvious result of these synergies? We are daily meeting the production, logistical, engineering and documentation specs of various 21st century designed jobs-----and zipping it all out to our customers for review, confirmation, compliance, even payment. And all of this being done routinely by constantly-updated TECHNOLOGY! Metfab Metals can only do this because it has 21st century technology. This also means we can---and do---provide our metal “solutions” with the aid of shop & office technology in our 21st century incarnation of this steel fabrication industry. We have learned and implemented better “solutions”, better methods, better production------------and better technology. Challenge us with your next job. We’ll prove it to you too. Metfab Metals is now an “AESS Preferred Vendor” (1). 1. Bill Gates, the legendary billionaire founder of Microsoft is reputed to have said: "Consistent employee use of preferred vendors will save us millions of dollars per year." Make us your Preferred Vendor. and, don’t forget, such specialty parts we can supply to you too. Actually we made 24 of these unique anchors! What do these 4 letters mean in the 21st century steel business? On our website, we dedicate an entire page to AESS steel, simply because we are finding that our customers are requiring more and more of this specialty work. What’s that old saying? “Give the customer what he wants.” Yup, that’s it. But we also want those of you that have never asked us for these items to know that we are thoroughly experienced with AESS. Not all fabricators can honestly say this either. And then deliver as spec’d. We can----and do this every day. Look at this specialty piece of metal fabrication, and focus on the size of this half-ton roof anchor. Yes, we can fabricate and finish for you these super-special parts, but we also can readily supply all the related products your RFQ is seeking, as well as all the miscellaneous steel that our customers need on a daily basis. Again a brief visit to our website will illustrate all we can do as your fabricator. Let me list a few things. E----If it’s made of metal, we can make it---CALL US, YOU’LL SEE THAT WE “DELIVER”. F----“GREEN” , LEED, SBA, SAM, AISC, GANA----we know and qualify for them all----AND we have the required documentation---AGAIN CALL US! Call us; you’ll soon see what we have written here is what happens there. Metfab Metals has decades of experience meeting your specs, making adjustments, then making these parts right and making YOUR jobs go smoothly and end successfully! Watch for future Infomercial updates after our Newsletters in direct emails to you and your project managers. [If we don’t have your company’s current list of project managers, as well as others, send it to us. 1. 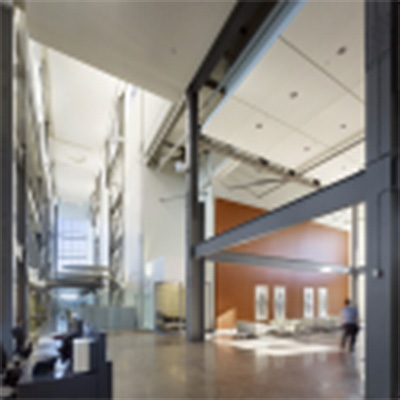 CISC Guide for Specifying Architecturally Exposed Structural Steel. Canadian Institute of Steel Construction, 2012, 2nd Edition, Page 7, primarily authored by Terri Meyer Boake, , B.E.S., B. Arch., M. Arch., LEED AP. We are grateful to her and this resource for all its very useful insights and clarity. This is a useful tool in both explaining this art, as well as drawing accurate specifications. This is what you will see from New Jersey a few years from now when the largest private development---“Hudson Yards”---is complete. We are proud to be a part of the contract team fulfilling the AESS and other early needs for these futuristic buildings. Wait till you see the “Culture Shed” (1) which is an understated way of identifying the venue where many classical and other performances will enchant NYC theater-goers and others for many generations to come. 1. For a great illustration of this unique architecture, look back here at our earlier Newsletter for March, 2014. We here at Metfab Metals have already delivered for an established customer some rudimentary “black steel” parts for an early phase of construction. 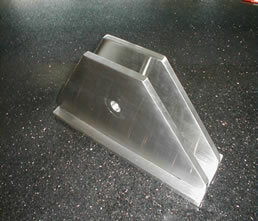 [We make anchors and miscellaneous steel parts every day, alongside our specialty “AESS”work.] We are also under contract for additional lower floor and entranceway “AESS” steel to adorn the primary facades of the first major building to be completed. Simultaneously, we are responding to RFQ’s for further ornamental “AESS” in the next stages of this cluster of unique West Side development. Keep track right here of what we are doing----and review this to see if we can’t do the same type of work for you---on your jobs throughout the USA, and even abroad. We have worked many times for jobs in Canada and both Central and South America. We are open to new jobs in these venues right now. Watch for our future ConstantContact updates after our Newsletters in direct emails to you and your project managers. [If we don’t have your company’s current list of ALL project managers, as well as others, send it to us. “AESS” (though that’s our forte)! There are five individual ideas recited in this single passage that we deal with every day with our customers here at Metfab Metals. Let’s review this briefly so you know even more from these the ways we can help you with your fabrication needs. Sounds odd somehow, but read on. First, we all realize that the fastest (“the swift”) human or even racehorse does NOT win every race. It’s a common occurrence in a marathon or a mile horse-race that one must manage his energy and control his horse if he is going to triumph in longer courses. Isn’t that what we MUST do when we have a contract to be fulfilled over 6-12-18 months; management is much more significant to a successful outcome than a burst of energy start with no scheduled and orderly follow-up? Isn’t it commonplace that we adjust drawings, change details, even change quantities as we execute a supposedly firm long-term contract? So being “swift” is not the key, managing, accuracy and execution are! And “the strong” do not win every battle----in either a physical confrontation or in the business sense. Recall David & Goliath (1), or even how the young Microsoft Corporation vanquished the very mighty IBM 30 years ago and more. In metal fabrication, it is not the largest or even the more financially superior fabricator that wins all contracts; Metfab Metals wouldn’t exist today if that were the case. Metfab Metals is nimble, responsive and reliable---a far more valuable set of traits for our customers than just powerful or “strong”! Nor are we here at Metfab Metals the “richest” or most experienced fabricator. Though we have been in this business since 1947, others are doing this longer---and are simply bigger. We are not the biggest and certainly not the highest revenue fabricator; but we do subscribe to the edict that “the devil is in the details” which details we scrupulously examine as we work and document for QC purposes---yours and ours! Nor do we have every “skill” to make EVERY possible fabrication. We do what we do best, starting with AESS and covering a broad range of products. We are nimble in this regard also, as we have almost endless “sources” and “outsources” to fulfill every aspect of a customer’s RFQ. If another of our sources (subs) can do an aspect (such as specialty finishing) better than we can, we send it out. That way our customer gets the best of both worlds---our fabrication, oversight & QC and our sub’s particular expertise! But it’s the “time and chance” aspect of this Biblical quote that perhaps best fits us. We have a long history of helping our customers (often initially NEW customers) when another fabricator has “dropped the ball”. And the customer needs our skills NOW as he has no extra “time” to complete his contract. We can’t even count the number of foreign-made parts that have come into our shops to be re-worked and retro-fitted to allow installation on a building TOMORROW, as the plans mandate! We take the “time” (and its pressure) and make the right result “happeneth”! That, in turn, leads to our new customer’s “happiness”. 1. Look for an interesting twist on this old fable in the recent book, David and Goliath, by Malcolm Gladwell (Little, Brown & Co., 2013) in either the Introduction at p,3 or Chapter One at p. 19 or Part Three at p. 195. The author argues that seeming disadvantages can often be turned to one’s advantage by a nimble, organized adversary. Watch for our future updates after our Newsletters in direct emails to you and your project managers. [If we don’t have your company’s current list of project managers, as well as others, send it to us.] We can’t send you these informative missives, if we don’t have ALL your contact information---and that of ALL your project managers. 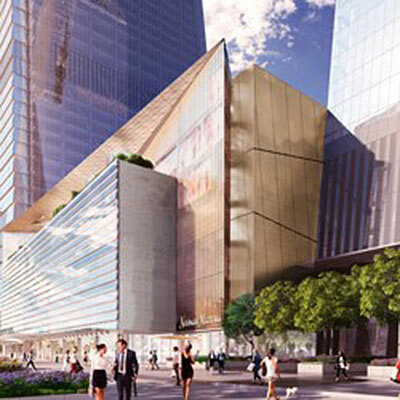 Hudson Yards, NYC, NY----Update: [Below is a recent news release from Neiman Marcus, the famous Texas retailer.] BTW, we fully intend to quote the obvious AESS steelwork on this glass-bubble façade, as well as the miscellaneous steel parts we routinely supply to new buildings. Neiman Marcus is opening its first store in New York City, in Hudson Yards being developed on the west side of Manhattan. “The store is not slated to open before 2018,” Karen Katz, the president and chief executive officer of the Neiman Marcus Group, told WWD. “Demographics show that the growth and population on the west side and south west side of the city is growing much faster than other parts of the city. Our expectation is that it becomes a tourist destination with a good mix of West Siders, people who also live downtown and international tourists.” NMG also operates Bergdorf Goodman, but Katz said she believes the company is underserving New York City. ONE of NYC’s NEW UNIQUE STRUCTURES and METFAB METALS IS SUPPLYING SPECIALTY METALS/FABRICATION, “AESS”--and more! We don’t fabricate all the steel for all of these unique structures, mainly because our customers (often the curtainwall contractors) don’t win all the contracts here. But we are doing the specialty steel work at innovative projects, such as 625 W.57th Street and at Hudson Yards (pictured below), both under construction right now in New York City. See our recent newsletters for more details on these creative uses of finished steel. (1) We can do this—and so much more----on your jobs too. Perhaps even more creative was the development of the new headquarters (see below) of the Nova Scotia Power Company in that eastern province of Canada. 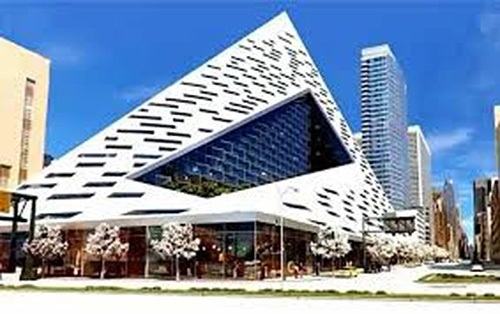 There the design team strove for, and was awarded, a Gold LEED certification in addition to erecting a striking example of the use of AESS (2) steel both inside and outside the structure itself. 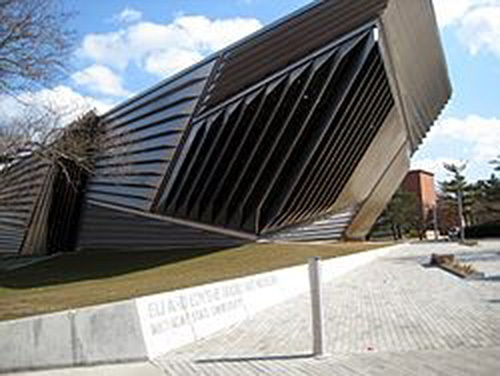 And these are not the only existing examples of unique fabrications materializing in all the major cities---and other venues (such as the Broad Museum at MSU, above) of North America. We are presently contributing our decades of AESS expertise to such job needs in both Washington, DC and New York. [Courtesy rendering of another view of this ongoing job at Hudson Yards, NYC, per The Related Companies. 1. Go to www.MetfabMetals.com and see, among others, our Newsletters for September, 2014 and August, 2014. You can also look at even earlier Newsletters, even those in earlier years, as archived on our website. Metfab Metals has decades of experience meeting your specs, making adjustments, then making these parts right and making YOUR jobs go smoothly and end successfully! Let us help you on your next challenging job too. Watch for our future updates after our Newsletters in direct emails to you and your project managers. [If we don’t have your company’s current list of project managers, as well as others, send it to us.] We can’t send you these informationals, if we don’t have ALL your contact information---and that of ALL your project managers. We are now also delivering to other major AESS jobs. So let us briefly tell you what our 2014 expansion has meant to us----and you; and what 2015 will bring. 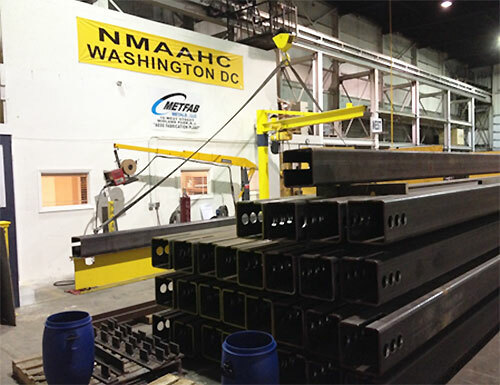 With the last shipment for NMAAHC now gone, we here at Metfab Metals have freed up our Midland Park specialty shop (opened in November, 2013 to facilitate NMAAHC) for current AESS work. Our AESS work has continued through late 2014, and now will continue into 2015 at two more creative projects, both located on the burgeoning Upper West Side in New York City. 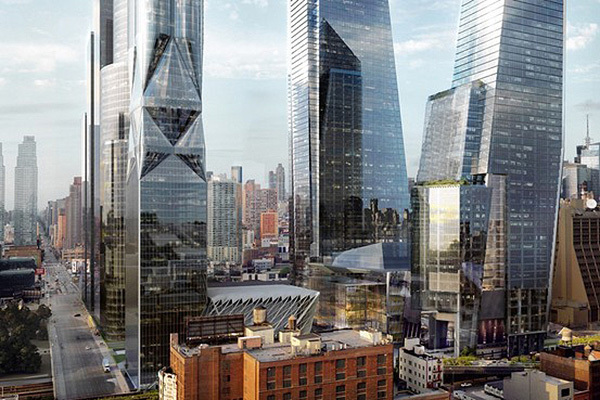 These are the Hudson Yards multi-use development and 635 57th Street high-rise. At the former, we are making finely-finished mullions for its first phase; while the latter requires unique “twisted” frames to accommodate its pyramidal exterior look. Both jobs have very demanding tolerances to make the requisite “fit” to promote the planned exterior appearance. But, as we have told you in many past Newsletters, we are not exclusively a “big job” AESS shop. Our Orange, NJ shops continue daily to turn out smaller such orders, light-gauge metal parts and “ordinary” fabricated metals of all types. 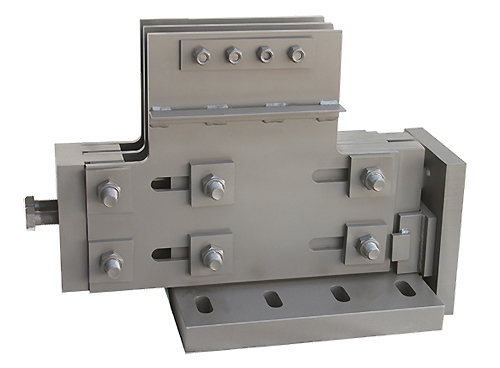 When you need specialty metal work----or just rudimentary anchors, shims, frames, notched beams, flashings or whatever----call us. We’ll respond with the high-quality parts all our customers have come to expect now for decades. 1. Though most of you are familiar with this term, AESS is the acronym for Architecturally Exposed Structural Steel----a catch-all phrase for any (large or small) finely-finished steel members (prepped, welded, filled, blasted, polished, and/or uniquely painted/finished) to be permanently open to the view and touch of all after the job is done. AESS work is never covered by sheetrock or otherwise hidden from public view. Our COO, Jim Murray, has been an integral part of many early AESS projects, such as the BWI International Airport [Now BWI Thurgood Marshall Airport] (erected almost two decades ago and serving the Washington, DC/Baltimore area). There you can see the structural steel ceiling space frame with its threads, pipes and connections in plain view-------- and still shining like its original fabricated & installed condition! Since then, Jim has overseen AESS jobs as varied as the American Jewish Heritage Museum in Philadelphia and the unique roof ladder coverage of an interior courtyard at 51 Louisiana in Washington, DC and the Borgata Casino overhang in Atlantic City, NJ. WTC4 (at the restored Ground Zero in NYC) and VCU (Virginia Commonwealth University, School of Medicine) are even grander and more striking examples of our expertise in this evolving art form and architectural esthetics. Metfab Metals is proud to have done the AESS components on all of these jobs. We have the capacity to do it all! Hire us; you’ll see; you’ll be pleased. in full compliance with your specs. That’s our commitment. That’s all. National Museum of African American History & Culture, Wash.DC ---- Done & delivered to our customer. We worked lots of extra hours and took all the time in needed meetings to get past lots of “speed bumps” cranking out nine (9) months of strict Project Management (which stretched to more than a year) all strict-tolerance AESS integrated frames, parts & associated elements of this job. Thank you for following this with us over the last year. 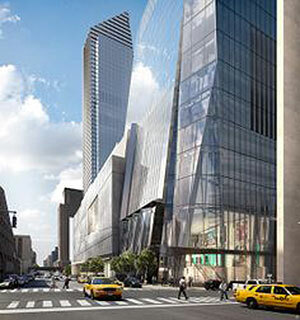 Hudson Yards, NYC, NY ----- This is our current challenge! Last year, we hoped to do this work; in 2014 it became a reality. 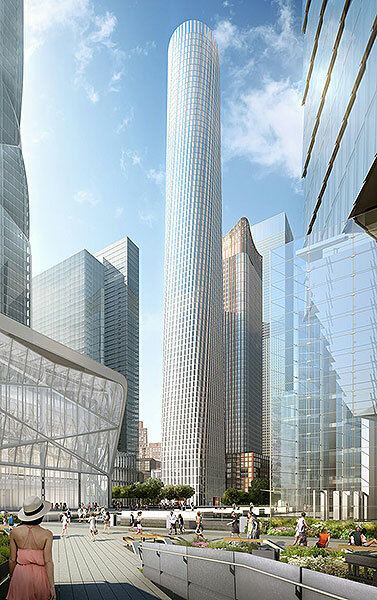 We are supplying this planned cluster of high-rises and other Hudson Yards development on the west side of Manhattan with the same type of huge pristine mullions we delivered to WTC4. Follow this work with us here too in the coming months.